Jurassic Island slot machine from Playtech slots was actually originally developed by bgo Studios in their brief spell of producing games, and as the name suggests takes us back to the land of the dinosaurs in the Jurassic period. For a relatively recent mobile slot the game actually looks rather classic featuring dinosaurs and more on its 5 reels. The game also has 4 bonus rounds, one of which offers players up to an incredible 80 free spins, which can lead to some big wins. Check out the Jurassic Island slot review below for all the details. If you’re looking for an online video slot that puts the player firmly in the driving seat, you could do far worse than saddling up for a dinosaur hunting expedition with Playtech’s unusual Jurassic Island slot. While we’ll get to the reasons that the Jurassic Island slot machine stands out from other Playtech titles in a bit more detail below, the first things you should know is that it is a five-reel, 25-payline title with a maximum jackpot of 1,000x your bet per line amount. The symbols are all dinosaur related and the background features an eccentric-looking hunter on one side and a ferocious raptor-style lizard on the other to set the tone. Playable from as little as £0.25 per spin across all desktop, mobile and tablet devices, the interesting thing about the Jurassic Island slot is its bonus features. Indeed, not only do the three free spins games on offer allow you to choose your level of variance, but the final feature also incorporates a skill element that allows talented players to maximise their winnings – a real rarity from a conventional video slot. 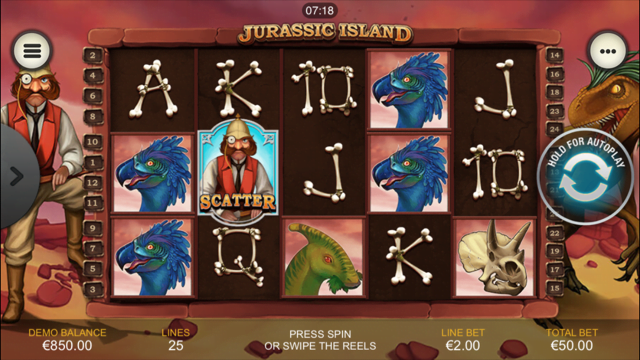 Dealing with Jurassic Island’s four main bonus features in order, players can choose any one of the free spins features so long as they land at least three hunter scatter symbols anywhere on the reels. Naturally, the more scatters they use to trigger the feature, the more free spins they’ll receive, but the modifier that comes with their bonus games is entirely up to them and influences the variance. The two safer options are the Carnivore Free Spins and the Raptor Free Spins, which feature only higher value symbols and expanding wild symbols respectively. The high variance choice, however, is the Multiplier Free Spins, which triple the value of any winnings collected but will frequently blank. If you don’t fancy any of the free spins options, you can instead choose to play the Hot Shot Hunter feature. Here, a number of dinosaurs will pass by the screen and it will be up to you to gun them down. Each successful hit will result in a cash prize, but if they manage to get away, you’ll receive nothing. The Slot That Time Forgot? While Jurassic Island’s graphics may look fairly dated, the slot was actually well ahead of its time in terms of features and the increased level of user activity certainly makes it an interesting title to play. Like the Jurassic Island slot review? Check out these as well…..